I have read the two other series written by Dean James/Miranda James/Honor Hartman and enjoyed every book. I have recommended them to my few cozy reading friends, they were so good. I finally got to this series under the name of Honor Hartman, A Bridge Club Mystery series. 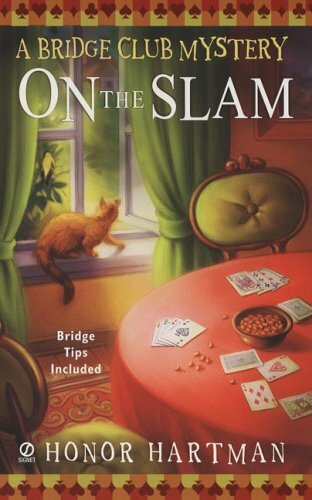 On the Slam is another delightful cozy mystery. I used to play Bridge years ago, along with several other card games, but I don’t know anyone who plays anymore. Reading this quick, fun cozy brought it all back for me. I actually went on Meetups to see if there were any local Bridge clubs I could join, alas there were none. I will have to get my fix vicariously through this series. The main character, Emma Diamond, is a widow, who recently moved into the neighborhood to be close to an old friend. There is a neighborhood bridge club and at the first meeting that Emma attends there is a murder. Emma and her Bridge playing sidekicks, jump into the investigation. The character of Emma is likeable and interesting. She is still grieving her husband, but not in the woe is me self pitying way. She seems to have too much self respect for that. There are interesting suspects and twists and turns on the way to a neat resolution. There are some hints of romance, not necessarily for Emma. There are also typical neighborhood gossips, cats, and dogs to round out the story. Highly recommended cozy. I’m off to order the rest of the series. Mayhem at the Orient Express, is a relatively new series from author Kylie Logan, who also writes the Button Box mysteries, which are quite good. In this series, there is a team of sleuths, Bea Cartwright, Chandra Morrisey and Kate Wilder. They are also neighbors and end up together due to the fact that they cannot get along and the local judge is fed up with it. 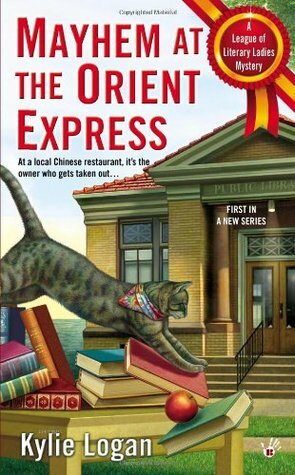 Sentenced to a book club and to reading Murder on the Orient Express, the women put aside their differences in the face of a real murder at their much loved local Chinese restaurant, The Orient Express. The story line runs many parallels to Christie’s work, which makes it a wonderful read for Christie fans. The female leads are very different and there is someone for everyone to relate to. Bea is the B & B owner with the mysterious past, Kate is the consummate business woman, and Chandra is the holistic healer, earth mother type. I really enjoyed all the characters, the ties to Christie’s work and the mystery itself. A fun, quick read for cozy mystery fans. I am sure I will read more in this series. This entry was posted in Book Reviews and tagged book, mystery, reviews. I just read my first Dean James book and enjoyed it. Never played bridge, however. And I read Mayhem at the Orient Express not that long ago. A great read. Bought the sequel yesterday.